I have been buying Sonnenschein/dryfit batteries (mostly this size) for well over 20 years to fit to a custom robotic wheelchair system I designed and build. I can say without any equivocation that they are without peer. Looked after they will last 15 years and even not well looked after they will last 10. About 12 years ago my original supplier stopped stocking them and recommended Yuasa as a replacement (you couldn't buy them on the internet in those days). For two years we fitted them (and most of the other brands available) to our chairs and then the problems started. 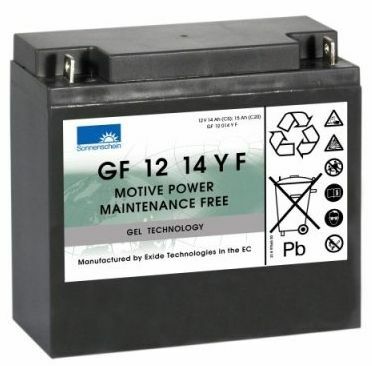 Over the next few years every vehicle had to have the batteries replaced. From that point on I have never used another brand of sealed Lead-Acid battery. Yet another _grudging_ example of German excellence in engineering and manufacturing! They have never let me down. A note on Tayna as a supplier - almost always swift, efficient, courteous, flexible and probably the best price online. Been buying from them for several years; not put a foot wrong yet. Excellent range of batteries at competitive prices. Technical support before purchase was very helpful and were able to organise VAT exemption on my wheelchair batteries. Both batteries were delivered next day. Will definitely return to Tayna for future purchases!